In the Merry Muddy Middle: Whatcha doin? 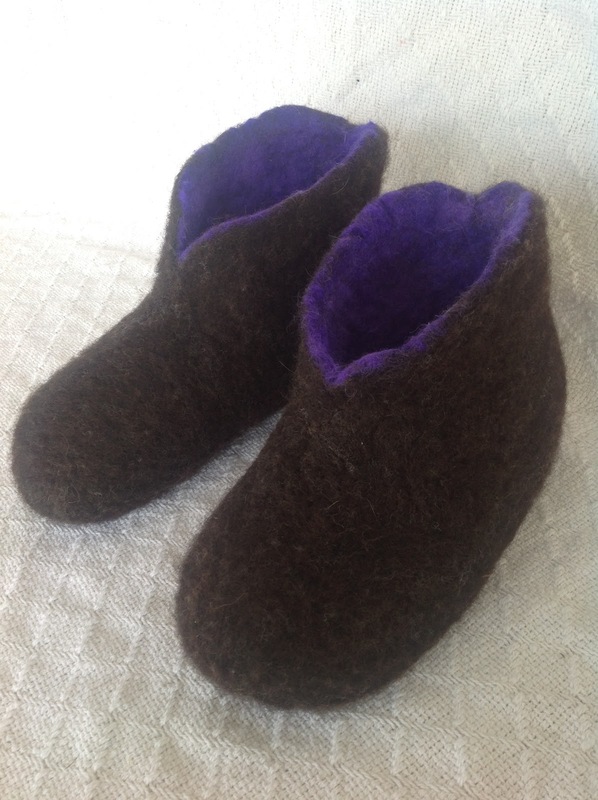 These are wet felted and then needle felted. Unfortunately they don't fit . . . "frown" The width is great but they rub my toes just enough to be irritating. 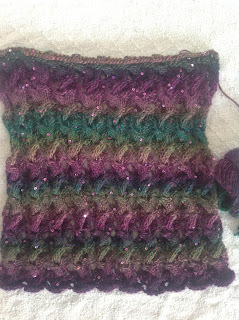 Next up is a sweater I'm knitting for my daughter. I had been eyeballing this book "Lovely Little Knits for Little Girls" at my local yarn shop Fiberworks, for a long time. I really like the look of 99% of the patterns in the book and when my daughter found this wonderful yarn with sparkles (universal yarns classic shades sequins lite - color 405 primrose) its so soft! Well, I could no longer resist. 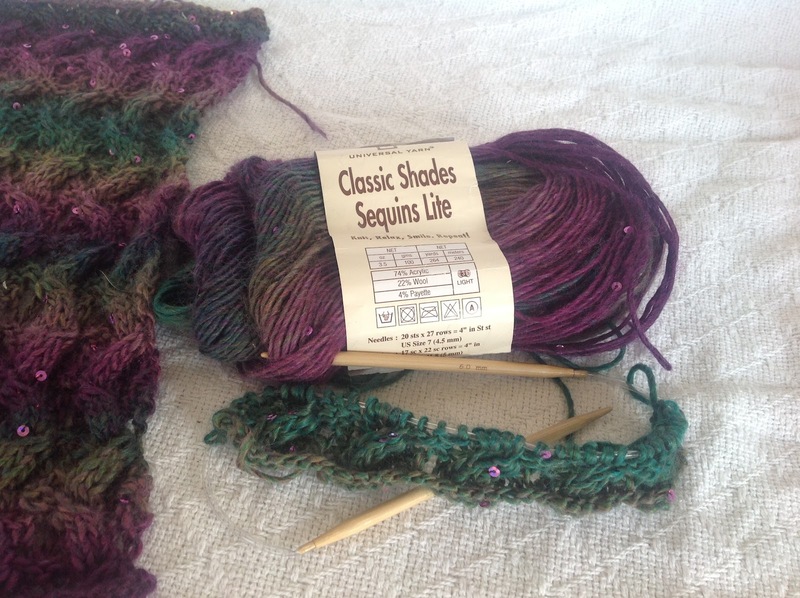 I looked at the yardage needed and got 4 skiens. 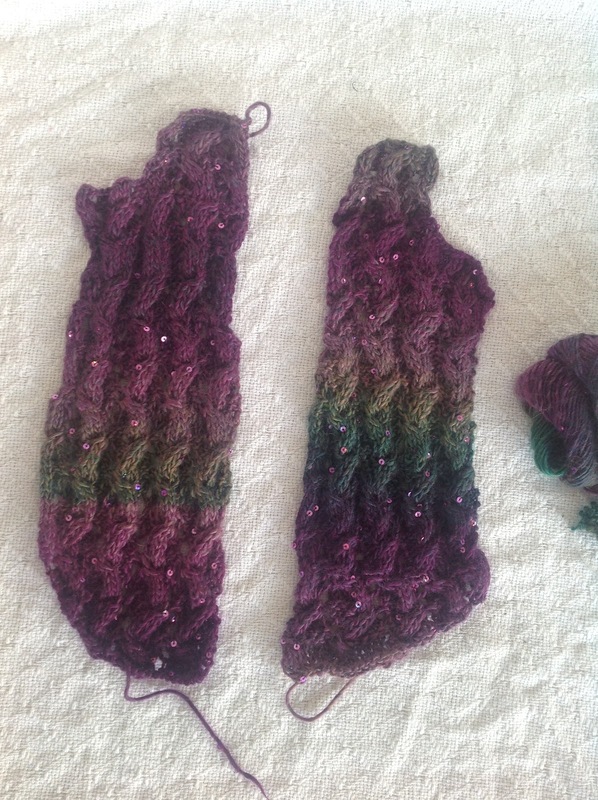 I should have read the pattern too, but having 2 extra skiens is not something I'm going to complain about. I've done the back, both front pieces, and one sleeve. First - The way its written you have to keep track of what row your on for the garment itself and the wave/cable has row repeats you have to keep track of. In and of itself this one's not too bad until you add in the increases and decreases. Now you have to figure out which stitch your on in a wave/cable row because it may not be the first one. I've taken to writing each and every row down on a note in my phone, along with any increases and/or decreases. Even doing this my counts are almost never right. Second - There is something very wrong with the sleeve pattern. Even if you follow the pattern exactly the stitch counts don't add up. And if you continue on for the 12 more rows it takes to get to the right stitch count, and then continue for 6 more rows just in case, the sleeve is still too short. I'm making the 7-8 yr old size and the sleeve doesn't fit my 5 yr old! They will be more like half sleeves. Which is ok, I guess, but I'm still miffed about it. Which is why its taking me so long to finish the other one. 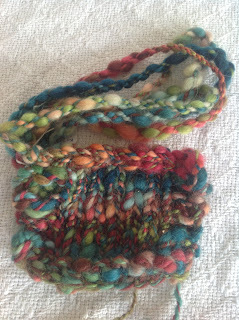 I took a class on Craftsy called: Spinning Dyed Fibers. 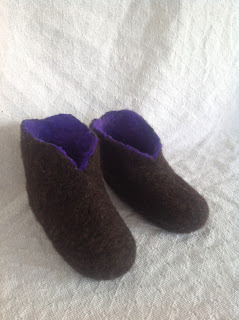 I love Craftsy classes and I really enjoyed this one too. It also made me think about how you can have a bit of control over how your yarn turns out. 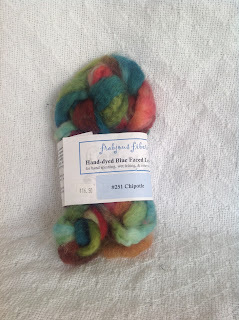 Something I never knew before, I just thought you grabbed your roving/fibers and spun however you felt like that day. 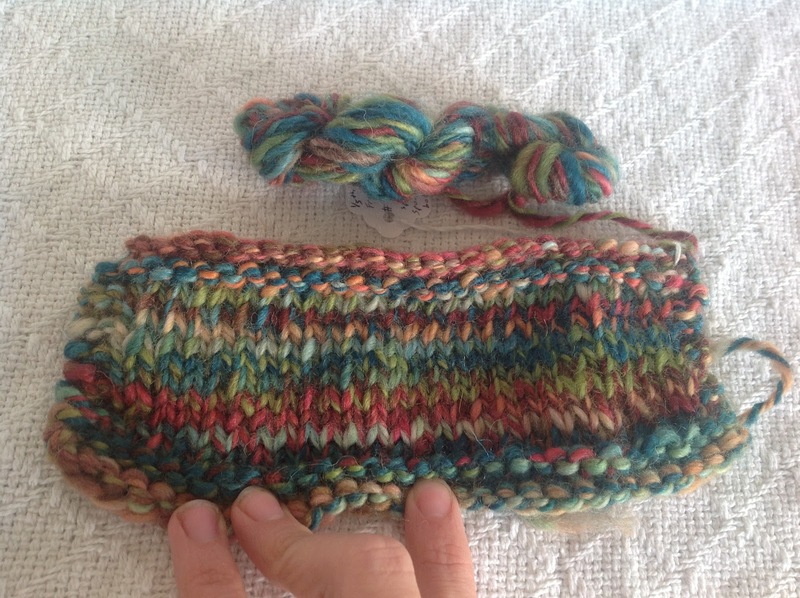 First I split it into 5ths and re-braided one slipping it back into its packaging. 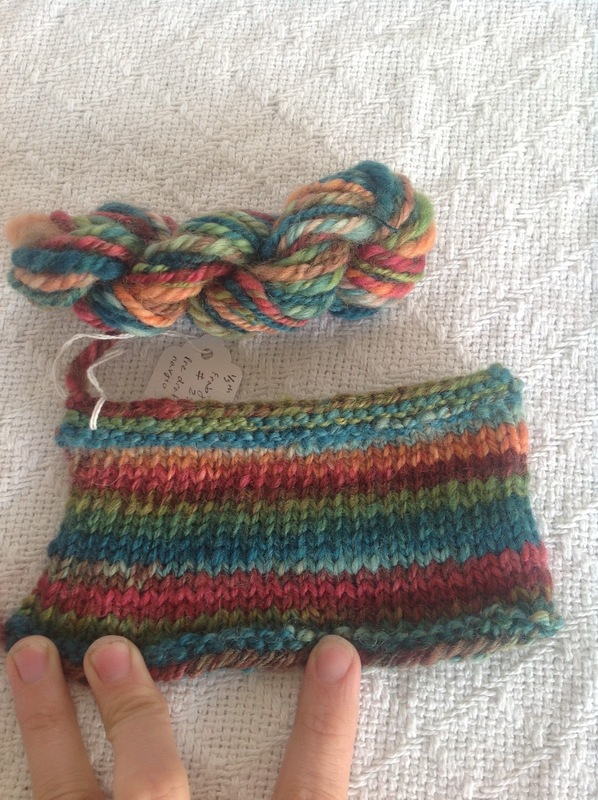 This 5th I pre-drafted and then Navajo plied it onto itself. For this 5th I split it into 3rds and spun each one to a bobbin, then I plied them together. This one I spun with a modified fractal spinning technique. I split the fibers in half vertically. I spun one half attempting a thick and thin texture. The other half I split into 3rds. One I pre-drafted and plied with my first half. The other two I pre-drafted, spun to 2 different bobbins and then plied them together. 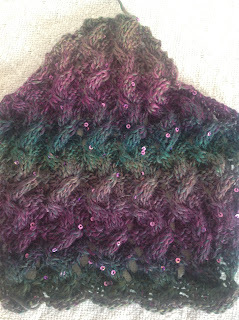 Then I cabled the two yarns together. For some reason I didn't write down or take a picture of the last 5th, ? ? ? Ooops! There are more projects but I'm having trouble coordinating how to get my pictures uploaded from my phone, camera and iPad, there has to be a better way . . . .